The obvious soundstaging of the mountaineering scenes in this movie is just pathetic, but on the small screen there won't be any excitement here for lack of scale. However, climbers getting together for a movie party should rent this movie because they'll laugh their butts off. Take the opening sequence, a desert rock-climbing accident in which the our hero (pretty blockhead Chris O'Donnell) is forced to cut his father loose to fall to his death in order to save himself and his sister (pretty, freckled and pouty Robin Tunney). The scene looks like a rip-off of the "Mission: Impossible 2" opening with Tom Cruise hanging off a 200-foot high rock face -- if the rock face had been made of foamcore and propped up in front of an enlarged postcard of Arizona. The actors' voices even echo like they're inside a gymnasium. The movie then jumps to a couple years later and a shaken Peter Garrett (O'Donnell, who doesn't seem shaken at all) hasn't climbed since. In the mean time, Annie Garrett (Tunney, "End of Days") has honored her father's memory by becoming magazine-cover famous after climbing her way to the top of the sport. But she hasn't forgiven Peter for their father's death, a plot point that barely comes up again after being introduced in the early going. Annie is helping to lead an adventurous billionaire (Bill Paxton) up K-2 in a publicity stunt for his new airline (the maiden flight is going to fly over the summit as they arrive) when egos collide with nature, trapping them on the mountain during a storm. At the base camp to cheer her on, Peter hears that Annie, the billionaire and another climber have fallen down a monster crack in a glacier. He organizes a band of eccentric (and expendable) rescuers, grabs a few handy canisters of nitroglycerine (don't ask!) to blast them out of the snow, and sets off on a suicide mission to bring her back. Oh, did I mention that Peter's group is being lead up the mountain by a crazed, mystically sage hippie-climber (Scott Glenn) who was his dad's army buddy and whose wife died on the mountain some years before? "They never found her body," someone says ominously, "so he just keeps looking." Barely two minutes go by in this picture without some kind of glaring nonsense in the script or the action. If it's not a climber saving himself from a Wile E. Coyote death plunge merely by planting an ice pick in some loose snow, it's the hottie rescue climber (Izabella Scorupco) agreeing to come along because there's a big reward and she needs $500,000 to go back to medical school. Huh? And let's not even talk about the fact that the climbers' backpacks clearly weigh nothing, that they're all dressed more appropriately for spring skiing than for mountain climbing above 25,000 feet, and that they're taking seemingly unexplored and impassable routes up the mountain which require leaping across canyons and scaling sheer rock faces in every other scene. 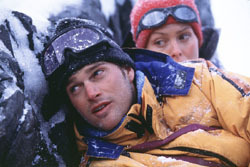 Campbell seems to think that the presence of Viesturs and the inclusion of a few high-altitude frostbite factoids gives "Vertical Limit" enough legitimacy leeway that he can exaggerate everything else entirely out of proportion and cast an attractive but talent-deprived actor to cardboard his way though the laughably bad script. But he's wrong. "Vertical Limit" is to mountain climbing what the WWF is to Olympic wrestling -- lowbrow sound and fury with no credibility.